Tottenahm Court tube station is about to undergo the next stage of redevelopment as part of the new cross rail work. The tiling created in the last renovation may be destroyed in the process. To enable the Bond Street station upgrade to get underway, Oxford Street will be closed eastbound between Duke Street and Vere Street for utility works from 14 February for nine months and several bus routes will be on diversion. From April, for eight months, the Northern line won’t stop at Tottenham Court Road station so that major structural works can take place in the platform tunnels. The Central line will continue to serve the station as normal. It would be a shame if that colourful tiling were to be destroyed. What a shame to destroy all the art. Would it look better afterwords? The closing of the stations is also bad. Oh no! I love the tiling there and must make time to photograph it myself before it is gone. It would be a shame to lose that beautiful tile work. That's terrible - it looks so interesting and bright! Great shot as the lines of the floor tiles and the tunnel really draw you into the picture. I love that artwork! A tube station needs something bright and striking to make it even vaguely attractive! It would be such a shame to lose all that art!!! I hope they find a way to save it! 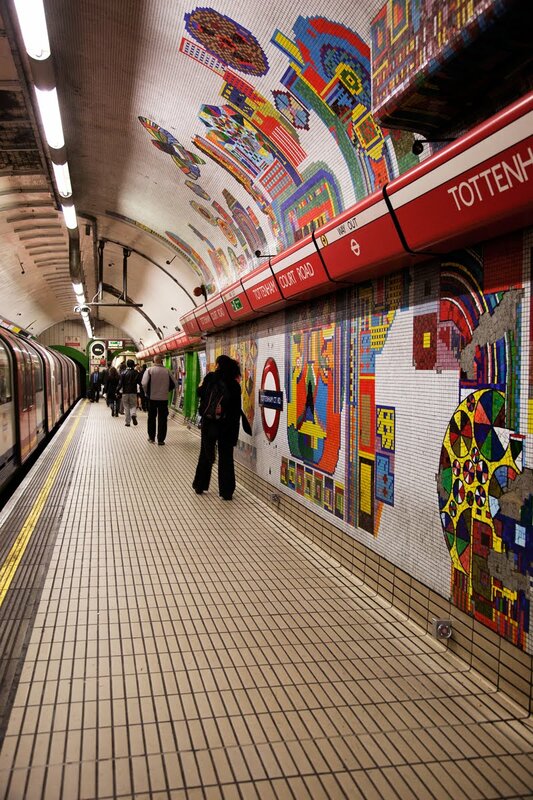 “London Underground highly values the Paolozzi mosaics within Tottenham Court Road Underground station, and alongside the Tube’s ‘Art on the Underground’ programme, we have been working closely with the Paolozzi Foundation as the Tottenham Court Road upgrade progresses. We are taking great care to protect and preserve these wonderful mosaics as we upgrade Tottenham Court Road station.